Description: Loaded coal train C-ABMBEN. Description: On the Frisco, headed north at Santa Fe Jct. Description: The highest number on the BNSF locomotive roster plies this SD70MAC on its way Westward on a COLX coal empty. Description: This faded Heritage 2 leads this Westbound empty coal train CSX rails, headed back to Wyoming for reloading. Description: The highest numbered unit on the BNSF system shoves hard on the back of a loaded train as it rolls through University. Description: The highest numbered unit on the BNSF roster, #9999, shoves on the rear of a coal drag at Locust Grove, GA. Description: BNSF 9999 - I thought I would never catch this locomotive. 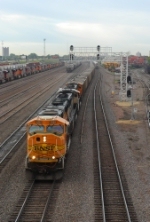 Title: My Hunt For BNSF 9999....Is Over! Description: BNSF 9999 leading a large freight north into Foley, Mo. Title: BNSF 9999 heads a north bound freight toward old monroe mo.